The Greek island of Lesbos is in full bloom during these spring days. The sun has warmed the Aegean Sea to swimming temperature. 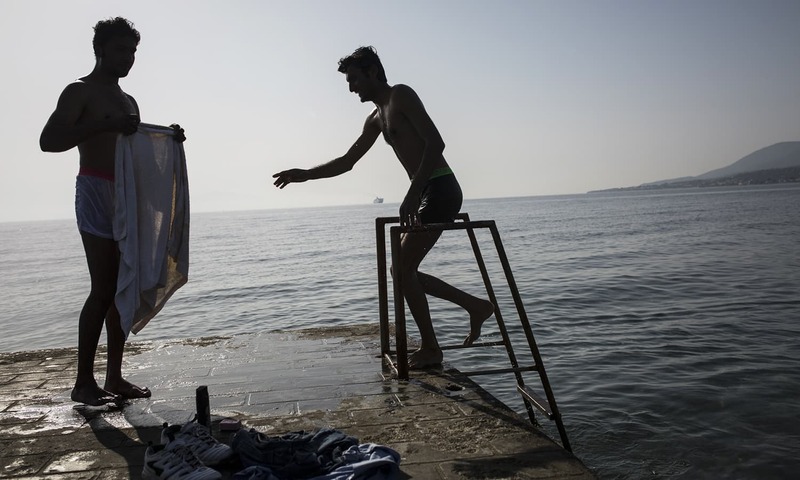 By the port of Mytilene, I saw two young Pakistani men wash themselves in the salty seawater, before returning to the squatter camp where they have been living for the last few weeks. I’ve been covering the story of migration to Europe for more than five years, but somehow, the Pakistani migrant workers in Greece feels like the last chapter. 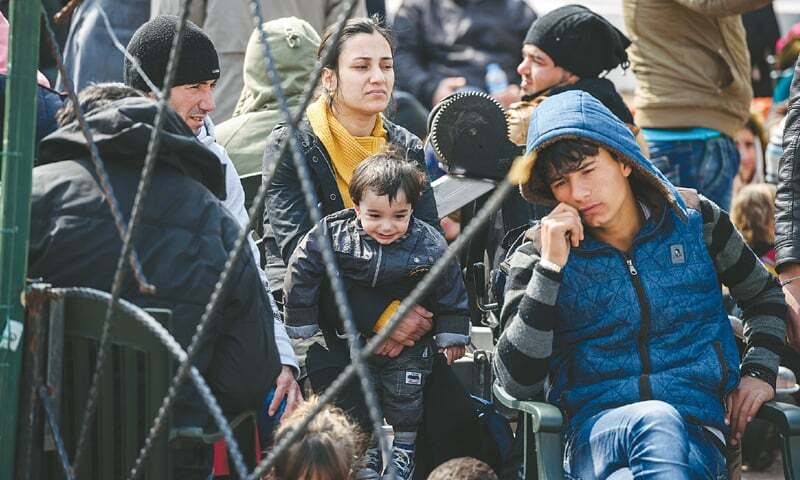 Arrivals have nearly come to a halt and these economic migrants are stuck all over Greece and former Yugoslavia, feeling increasingly desperate as they begin to realise their fate. They are not getting to Germany or the UK anytime soon. 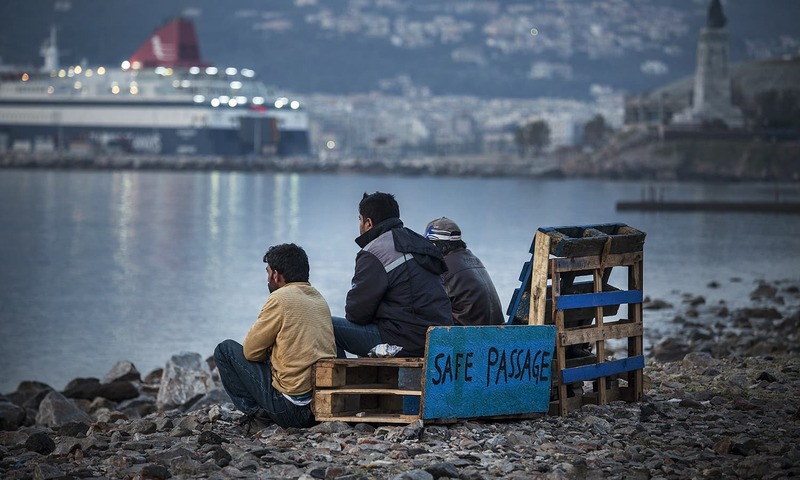 The EU has decided instead to send economic migrants to Turkey from Greece as part of a deal struck last month. An economic migrant stands near the port of Mytilene on the Greek island of Lesbos close to an informal squat camp which is run by No Borders Kitchen, a European anarchist group. 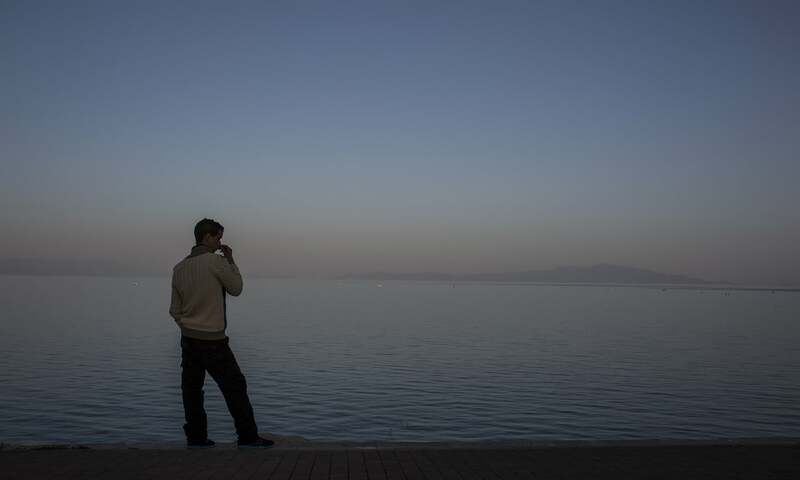 An economic migrant stands near the port of Mytilene on the Greek island of Lesbos close to an informal squat camp which is run by No Borders Kitchen. Between 300 and 400 people, mostly Pakistani, are camping on the beach on the Greek island of Lesbos at the No Borders Kitchen. 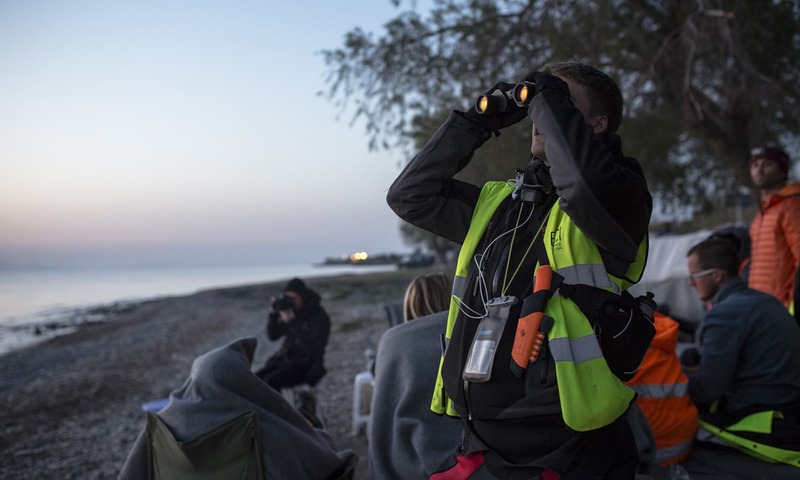 A European volunteer uses binoculars to look for migrants arriving by boat to the island of Lesbos in Greece. International volunteer teams have organised rescue mission, food distributions and all manner of aid for economic migrants arriving in Greece and along the Balkan route. 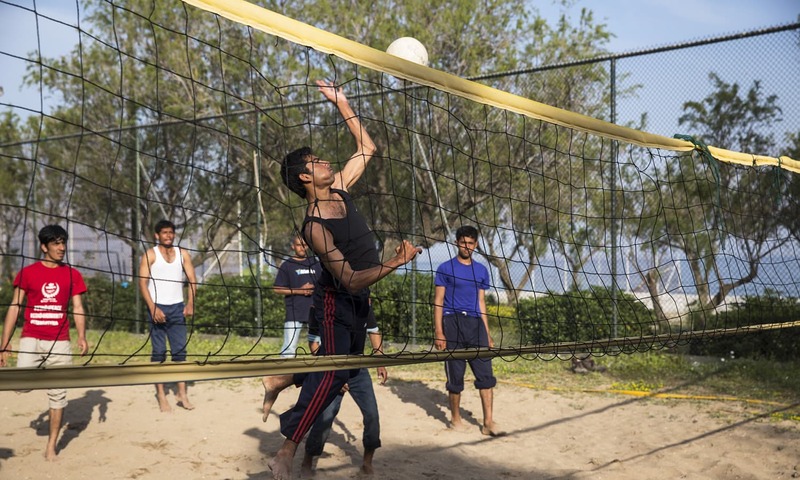 Unlike others who are locked in a detention facility a few kilometres away, these young, mostly Pakistani, men spend days sitting on a hillside overlooking the sea playing Bhabhi (a card game) or volleyball. During the cool nights, they gather around a fire and sometimes sing Pakistani songs. At meal times, they receive simple dinners of rice or potatoes with vegetables and beans, provided by donations collected by European volunteers. Occasionally, volunteer Spanish lifeguards come by with bags of raisins or nuts. 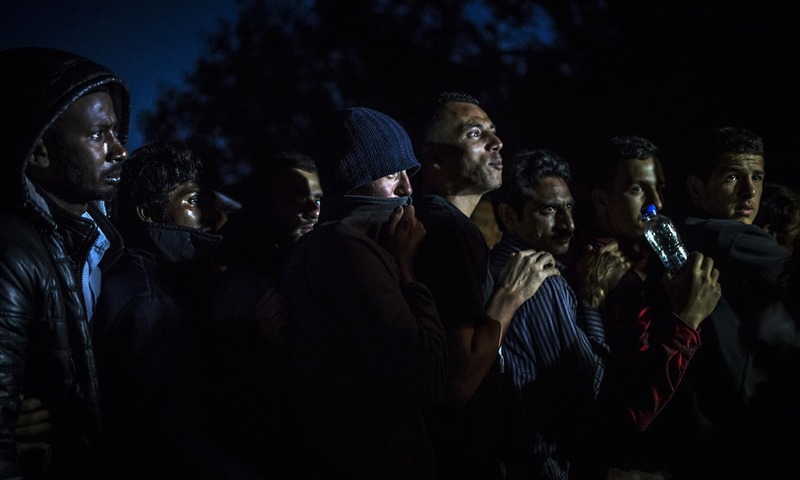 When they appear, hundreds of young migrants run to the receiving line. Lolo from Madrid greets his Pakistani friends with hugs. "They are some of the ones I saved from the sea," he told me. Young Pakistani men after taking a bath in the sea on the island of Lesbos, where hundreds of Pakistanis have been stranded since the Balkan route was closed down at the Greek Macedonian border, at which time Greek authorities decided to prevent migrants from traveling to the mainland, which is already overflowing with migrants. 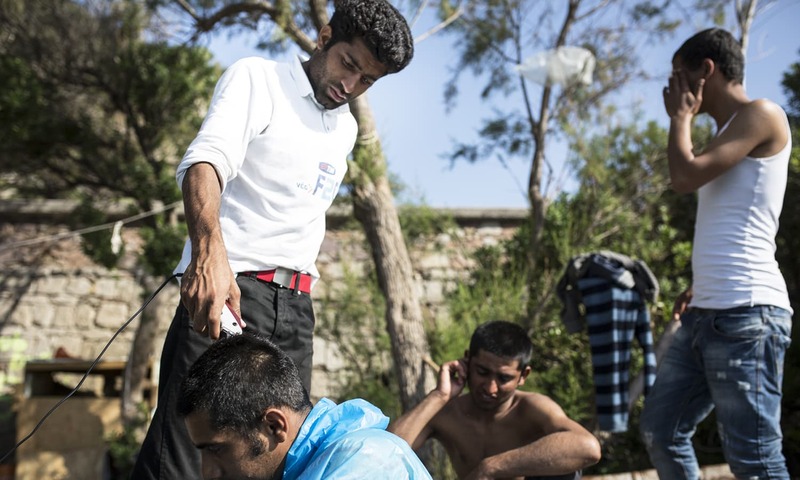 A young Pakistani man named Amer cut Abdil's hair at the No Borders Kitchen, an unlicensed camp run by European anarchists on the shore of Lesbos island in Greece. 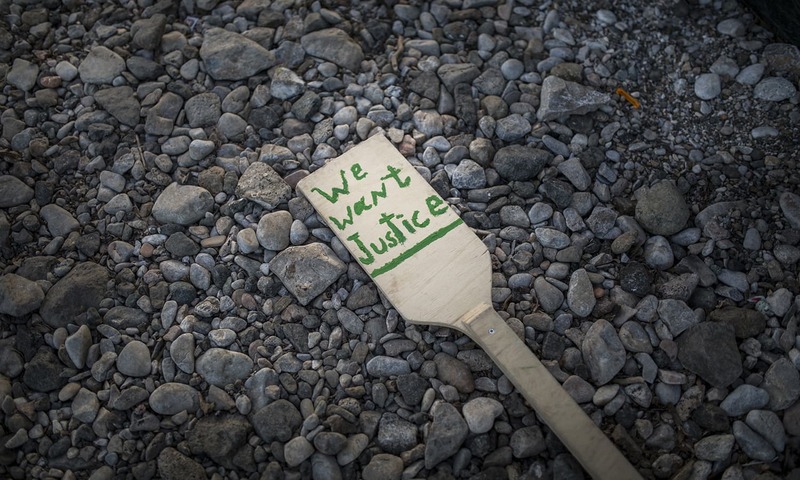 A protest sign at the No Borders camp on the island of Lesbos on April 7, 2016. Although already warned they would be transferred to a detention center on the island, they've been granted a reprieve by the local mayor for an additional week. 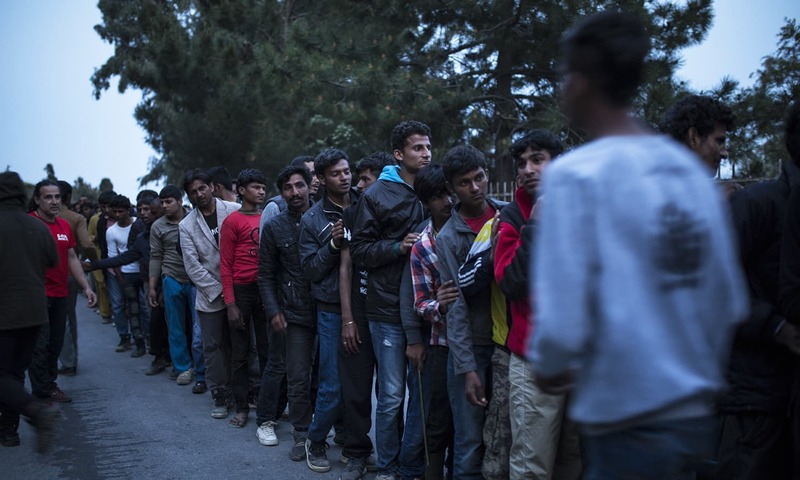 Migrants, many of them Pakistani, line up for dinner at the No Borders camp on the island of Lesbos on April 7, 2016, which is run by volunteers. Although already warned they would be transferred to a detention center on the island, they've been granted a reprieve by the local mayor for an additional week. Nineteen-year-old Omar who was in his second semester of studying electrical engineering at Gujrat University when he decided to leave Pakistan three months ago. 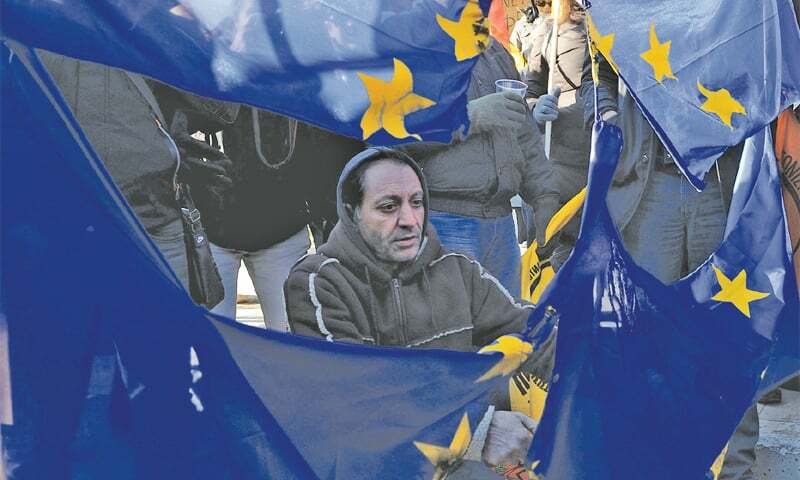 After a long journey, he arrived in Greece, but he was too late. The Balkan route had already closed and he, like more than 50,000 other migrants, is now stranded. Although he has brothers working on another Greek island, Greek authorities are not permitting migrants to board ferries or planes to reach other parts of Greece. He said that, "a lot of people cry here for many reasons." Ijaz, 38, a labourer who is the main provider for his family, including his wife and two young sons and his elderly parents, sold his house to finance the trip to Europe. "I am a very poor man. My children have no education, good food or clothes." Now his dreams of lifting his family out of poverty has been dashed. "I'd rather die than be sent back to Turkey," he said. 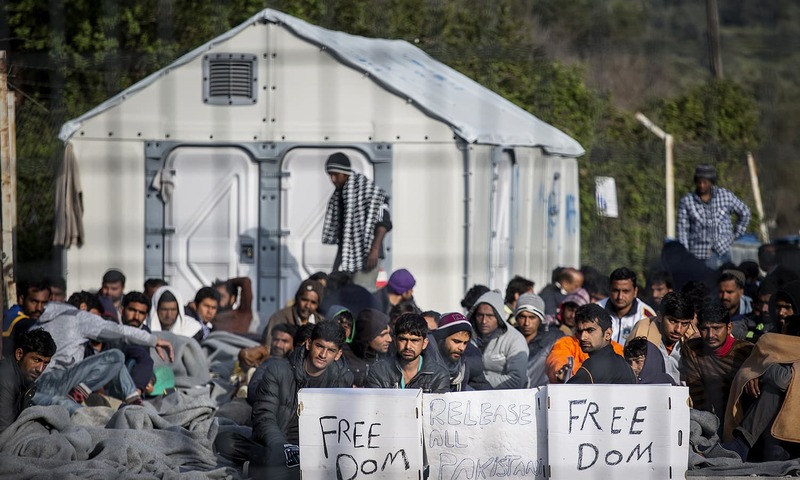 Pakistani men at the No Borders camp at the port of Mytilene, Lesbos island, on April 7, 2016. They are on high alert since the local mayor insisted that they abandon the camp and go to Moria, a closed camp where migrants live in prison-like conditions. This week Greece began deporting migrants, the vast majority Pakistani, to Turkey. The people living at the camp are neither happy nor calm, probably the two things they left home in search for. Instead, they are on constant alert, knowing that at any time the police may raid the camp, dragging the migrants to detention. A spokesman from the mayor’s office told me that if they don’t go peacefully, police will have to be called in and migrants will be taken to the detention facility. Even more threatening is the probability of being deported to Turkey which intends to sends migrants who do not meet asylum criteria back to their countries of origin, under readmission agreements. Last week, 326 migrants were deported, among them 200 Pakistanis. Pakistan migrants hold a hunger strike sit in protest at Moria Camp, a detention center on the Greek island of Lesbos on April 7, 2016. 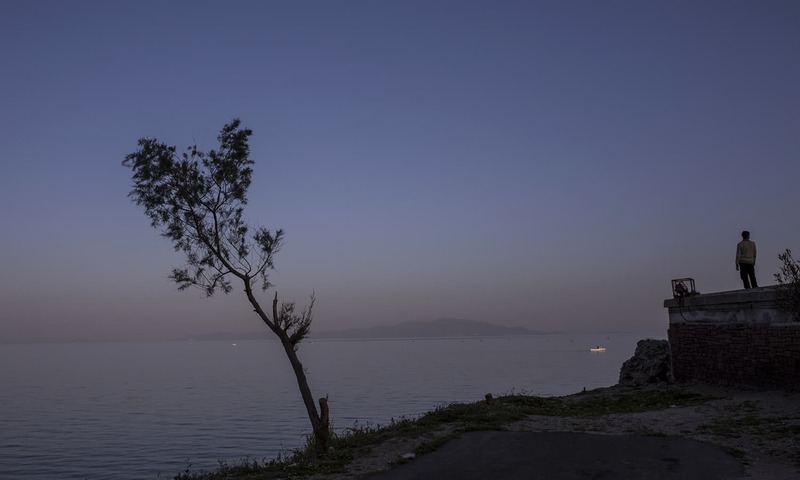 Hundreds of Pakistanis are trapped on the Greek island of Lesbos. Greece began deported immigrants to Turkey last week, among them more than 200 Pakistanis, vastly more than any other group. 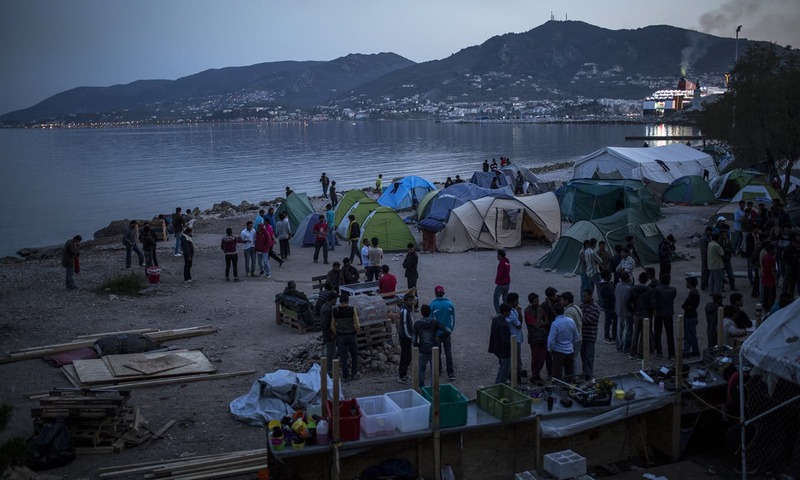 At the No Border Kitchen, an unauthorised camp on the beach on Lesbos island, migrants found a way into the locked volleyball court and have been holding daily matches. Although daily life is pleasant now that the weather is good, many people are very stressed and nervous about the prospect of being forcibly deported back to Turkey and perhaps after that back to Pakistan. 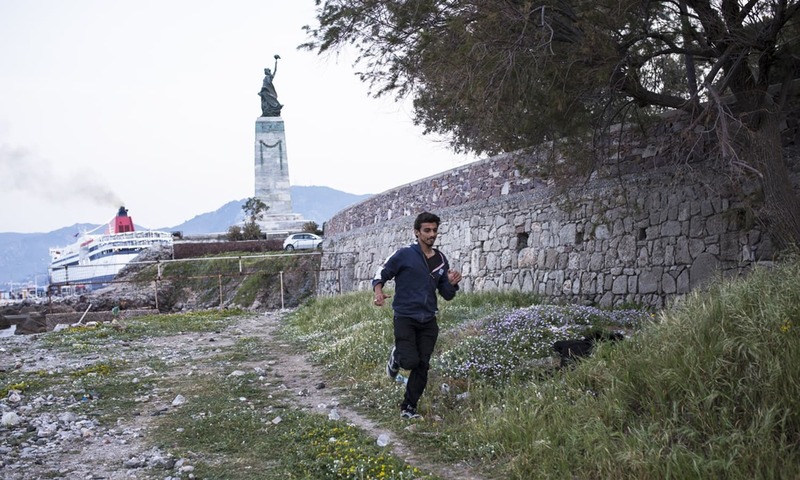 A migrant runs from police back to the relative safety of the unauthorised No Borders Kitchen camp on the Greek island of Lesbos. They are made to stay near the camp, and at night police sometimes prevent them from entering the port area and city centre. 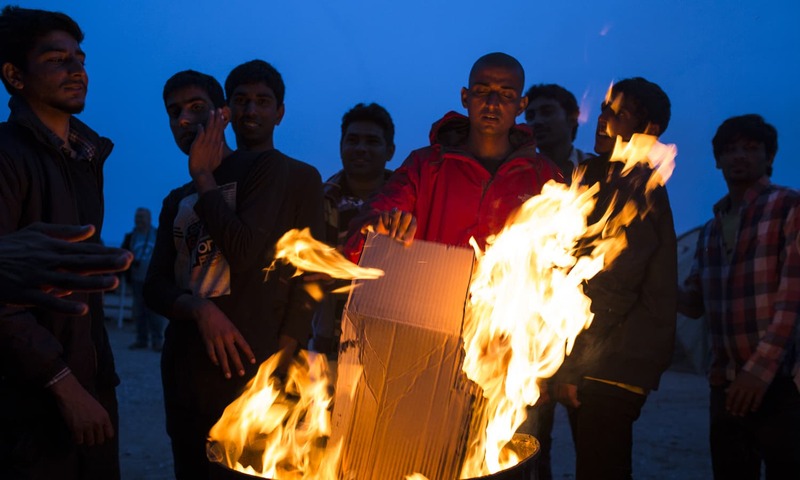 Pakistani men warm themselves by a fire in the evening at the No Borders Kitchen camp. The weather on the Greek island is hot during the day but drops significantly at night. Migrants, the vast majority of whom are Pakistani, line up to receive food donations from Spanish volunteers. Between 300 and 400 migrants, about 90 per cent Pakistanis, are camping at the unauthorised No Borders Kitchen camp, which is overdue to be vacated. 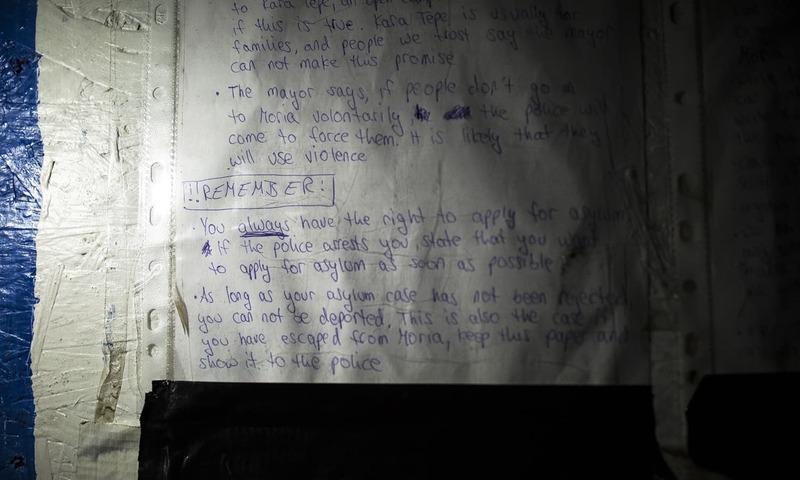 An announcement, posted in English and Urdu, regarding the rights migrants have in Greece to ask for asylum, at the No Borders Kitchen, an unauthorised camp on the island of Lesbos in Greece. 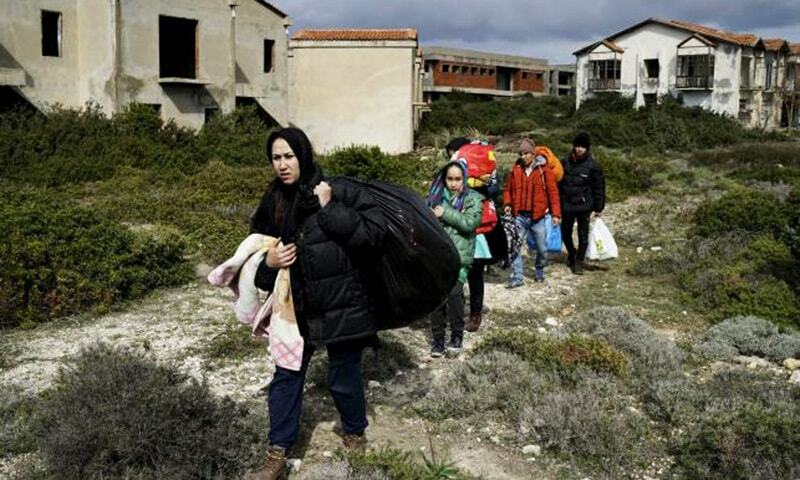 On April 8, 202 migrants were deported from Greece to Turkey, among them the biggest group was 130 Pakistanis, followed by 42 Afghans, the rest from Iran, Congo, Sri Lanka, Bangladesh and India. At the same time, Turkey has been working on the details of a readmission agreement with Pakistan, in order to implement a second wave of deportations from Turkey to Pakistan. "My hair turned white due to the tension," explained Ijaz, a 38 year-old father from Gujrat. 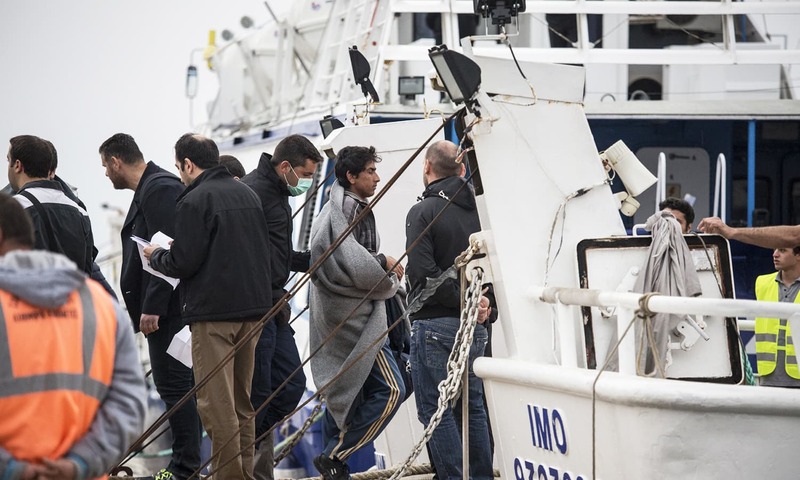 The sole provider for his family (including two small boys, wife and elderly parents), he sold his family home to pay for the dangerous journey from Pakistan through Iran, Turkey and then by sea on small flimsy rubber boats to Greek islands like Lesbos. 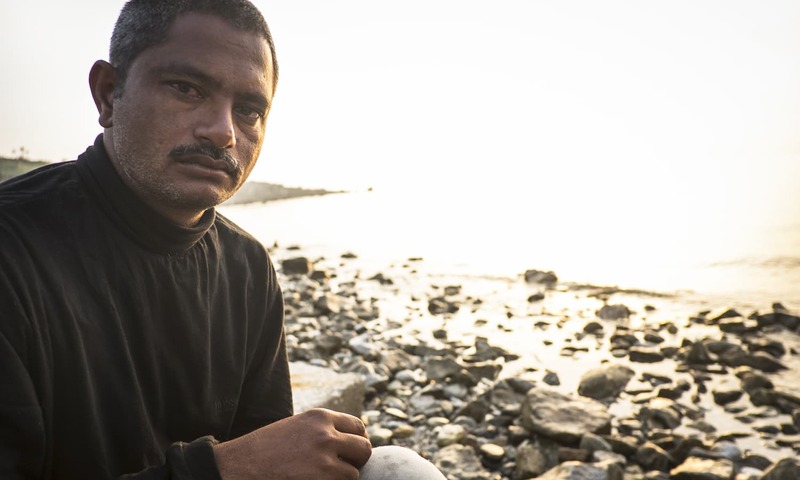 Sitting on the rocks by the seaside, Ijaz told me: "I am a very poor man. My children have no good education, good clothes or good food." He covered his face with his hands, then looked at me forlornly. Like many others, he has lost hope. He is terrified to be deported back to Turkey, neither a safe country nor an easy place to find decent employment. Hassan from Lahore, who spoke to me by telephone from inside the detention center, recounted how he was kidnapped in Istanbul. He told me that an Afghan man offered to help him find accommodation. The accommodation ended up being a basement apartment, where he was beaten and held for ransom, until more than a month later, his family paid 3,000 euros in ransom. Other Pakistani men told me similar stories. For these migrants, Greece — where they are treated as less than human, where they reside in sheds and eat food that the other inhabitants of the island country would not even touch — is still lesser of the two evils. "We'd rather die than be sent back to Turkey. It is not a safe country," they said. 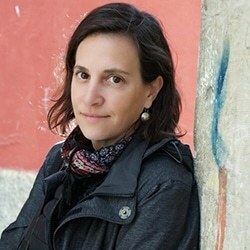 Jodi Hilton is an American photojournalist who has been covering migration in the Middle East and Europe since 2010. She graduated from the Missouri School of Journalism. In 2008, she travelled across Pakistan and published her stories and photographs in Europe and America. This is shameful for Pakistan. People are running away and prepared to die rather then come here? very sad and depressing ! The unfortunate part is that many of these migrants have paid heavy sums to human traffickers and not being very educated continue to be exploited by criminals who continue to lure them of the future that lies ahead of them. The reality is when these migrants reach Europe they still end up doing the most low paid jobs or just survive on social welfare. Is this a bright future? someone should show the reality to all the aspiring migrants back in Pakistan. What an irony, Nawaz and likes stashing billions in their pockets and live like Kings, whereas our eligible young unemployed men are under the open sky, away from their mother land, being ridiculed and given a treatment worse than dogs. I am sure Jinnah would be proud. So depressing. Are really things so bad in Pakistan?! @A Shah: it's not shameful for Pakistan, it's shameful for these irresponsible people who do such acts of illegally crossing borders and bring a bad name to us Pakistanis who are living and working here legally. If these men were man enough, they would have worked hard, and taken the legal route, which most Pakistanis take. I read a couple of them were students in University, they could have just waited long enough to finish their studies and come here as a student and then make a living legally. These people are lured by the dreams of becoming rich overnight in Europe otherwise there are many well paid jobs as a plumber, technician, carpenter, mechanic etc. in big cities. These are misguided young men who brought shame to our nation. These NGOs should not help them. Pakistan has better economy than Greece with much better prospects & 'ease of doing business' factor. Dumb people. Pakistan government never bother about these unfortunate citizens. Even people from no conflict zones of Pakistan are fleeing risking their entire life's savings and an uncertain future. Is it so bad a situation in Pak? We are all having problems living in pak like injustice, poverty, corruption and terrorism but leaving pak is not the best choice, we have to live here and sow the seed of education so that one day all of these problem come to end. they had enough money to go there .couldnt they start some business here. Govt is sleeping as Agents are doing brisk business and looting gullible poor people by showing them rosy picture of life abroad. Its better to die hungry but with pride in my own country than living a dogs life in an foreign land like a second class citizen. Govt as well as NOGs should immediately start campaign against unauthorised immigration and start acting harshly against such agents. People should be educated not to fall on their trap and make their own life. Else they have to pay the price with sufferings what these people are paying. 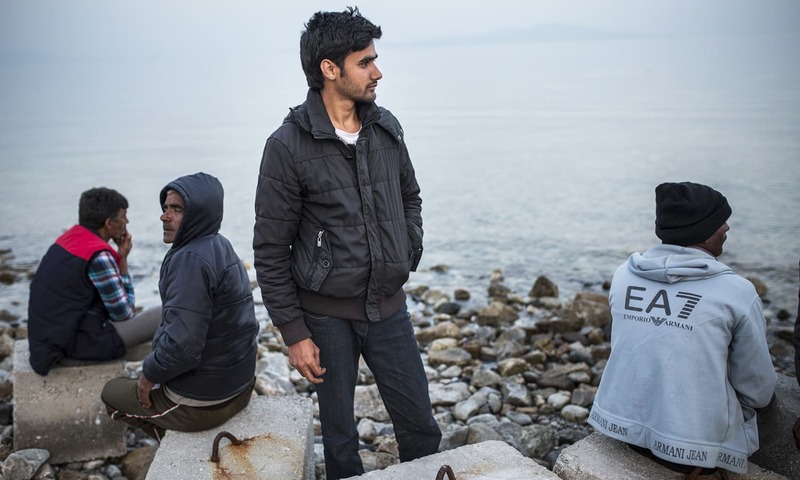 These men are fleeing Pakistan for lack of opportunity, or to escape poverty and violence. Risking their life to earn a living! The rulers of this country, are in the meantime, enjoying themselves in London, at taxpayer's expense, or with the wealth looted from this poor country, living a good life! Although conditions are not that much bad in Pakistan what kind of people are they , in Pakistan almost every thing is available through hard work they can achieve appropriate living standards well paid jobs are also available, they could have gone through proper channel if they really wish , I am surprised to know that such people spoil their career and country name as well by dreaming to become rich overnight. @Abdul Wahab By their own choice. Noone asked them to leave and search for jobs abroad. They first need to try here rather than dreaming of making money abroad with less/no education and skills. Very sad indeed. However I feel these people are themselves responsible for their misery. Grass is always greener on the other side! @Zubair Abro Is that why most Pakistani politicians have homes in Dubai or UK; have kids living abroad when there are 'good paying jobs' in Pakistan; have bank accounts and offshore companies with hidden wealth all over the world; and are always flying around to these places at taxpayer's expense!? Maybe these men saw how hollow the promise is, and decided to try their luck somewhere else? The real question is, why do they prefer any other country to Pakistan? @Jamal : "I am sure Jinnah would be proud." Jinnah's Pakistan ceased to exit many decades ago. His dream was destroyed a long time ago. @Zubair Abro "in Pakistan almost every thing is available through hard work"
I find majority of the Pakistani immigrants from Punjab where there is peace, more development and opportunities as compared to other provinces. Well, if a migrant from KPK or Balochistan migrates, it makes sense. @abdullah they should, but are probably deterred by the state of affairs. Pakistan is not the best country to start any sort of business. It's a big shame for us that people would give up reasonably respectable living here to be in western countries where they have to work on odd jobs. This really says a lot about severe lack of opportunities our governments present to the people. From the photos, most of the Pakistanis are young and some of them may even be educated to a reasonable extent. I can understand if they migrate from their villages to the big cities of Pakistan itself, for their livelyhood. ut leaving the own country behind in search of a decent life...what to say? The sad reality is that most of the migrants constantly risking their lives to cross the Agean Sea or The Mediterranean, are Muslims. What does this surge of exodus from North Africa, Middle East, Pakistan, Afghanistan, and Bangladesh or Mayanmar say about much of the Muslim regimes? Everyone of them have failed their people; mismanaged the resources; are corrupt and cannot even provide basic security or three meals to its people. And yet there are some fabulously wealthiest Muslim countries in the Middle East, who have not lifted a finger to take in any of these refugees! @Kamran No. It is shameful for Pakistani Govt. who fails to provide basic needs of living, majority of the university graduates fail to get jobs cause they do not have either enough money to bribe or 'sifarish' of someone powerful. That is the reason people run from Pakistan. Only difference is the educated class tend to apply immigration via legal channels, these poor souls just thought of doing it by hook and crook method. But to top it Pakistanis run from Pakistan because there is no future here. No matter how patriotism any one shows towards Pakistan, truth is that every one is helpless in front of these tyrants who live like kings while there people suffer. Funny and Indians are going back home from other countries. It's more of a short cut and greed of these people. Unfortunately they bring a bad name to all hardworking and honest Pakistanis in and outside of Pakistan. Who is charging these young men an arm and a leg to flee from pakistani airports? These poor Pakistani are suffering and Nawaz Imran Jardari Bilawal try to save their tax in other countries. Well seeing there situation I feel pity. Pakistan is running headfirst towards a situation of absolute disaster. Corruption, lack of opportunities for the talented - specially if they are honest as well, nepotism (sifaarish) is leading to declining real incomes and affordability. Religious fanaticism is totally unleashed, leading to a culture of hate and intolerance. No wonder people want to leave. But how many can do it legally - not even a handful. Cost of education abroad in unaffordable for nearly all, window of immigrating as skilled workers with Pakistani qualifications and experience is shrinking. So what do people do. Illegal immigration gives bad name to Pakistan, but the blame is attributable to the State of Pakistan and not to those individuals. Very Bad . This show people have lost hope in their country Pakistan. These Pakistani nationals are the responsiblity of our government to bring them back to Pakistan whatever the cost. When billions of dollars have been taken away by elite of the country these poor nationals must be brought back. How about the PM bringing some of his offshore wealth to rehabilitate these poor people? One needs to weigh the opportunities provided and make sane decisions. The man who sold his house in Gujrat to travel to greece actually made a bad bargain. Living overseas is not a rosy idea specially if you are not skilled. Not all of these Pakistanis are pushed to the wall back home, they just think that it's all very hunky dory overseas. If the state is not loyal to its citizen, who would love to die here? Eduacted people should spend more time on finding out why Singapore, S.Korea , Taiwan, Hong Kong, Japan , China, Turkey made progress . I read a report which said most of these migrants are from Gujrat and surrounding. What is wrong with Gujrat? I personally think it has to do with the anxiety that these avenues may close soon. I remember as a child most illegal migrants prior to 9/11 used to travel from these places all the time. Maybe their relatives are telling them to take a chance ASAP. This creates problems in so many ways. @DESI I don't know which world you are living in but graduates in Pakistan who have skills can easily find jobs - there are lots of jobs in all sectors, especially for graduates. Even non graduates, who have the attitude and will power can do a lot. What is missing is the attitude of some youngsters who don't have good enough skills and attitude to sell themselves. They want to be a 'seth sahab' right from the beginning. Besides, people who are wondering if situation in Pakistan is that bad, it's not. It's just that most of these economic migrants come from the area of Gujrat and around, where there is sort of like a 'tradition' that the young have to go to Europe and make ton of under the table money and get married to a gori and get a passport. And to all Indian friends commenting here: Go do some research, many of these illegal immigrants are also coming from India. It has nothing to do with losing hope in country but being foolish enough to think that once you are in Europe you'll find a bed of roses for free. In a recent report, India is having reverse brain drain. That is people from the US and UK who are working in the IT fields for example, are moving back to India for the new upcoming opportunities there. India has made progress in leaps and bounds from the last few years. Why cant we do that too, so people dont leave?? there is no war like Syria then why are they leaving country illegally. People in South Asia in general are gullible, lazy and day dreamer. They are also known to not like rules and regulation. So the social set up is making these things difficult. What a shame!!! for us all as Pakistanis.... if only our morally corrupt politicians have an iota of humanity in them, they can utilize some part of the looted billions to rehabilitate these migrants and other similar people living below the poverty line.... but this appears to be a far cry in front of the insolent and corrupt elite of this country. On the other hand the Global Humanitarian organizations and UN, etc are requested to intervene and devise some mechanism for recovery of the looted money of the 3rd world countries and utilize the same on the rehabilitation of these poor masses!!! @Kamran I have been trying to find if there are any Indians in this lot. Many reports that covered this deportation of 202 did not even mention any Indians - so I assume that is 1 or 2 or something negligible. I doubt that even 1% of these illegal immigrants are Indians. I would love to see any numbers if you have them. Ok wait....What!!!!!!! Since when did Pakistan become such a mad house that people had to run away. I mean seriously. These guys can accept humiliation and begged food but not freedom of their own motherland. They are getting what they deserve. If one has the guts, Pakistan is one of the most lucrative countries ever. And my statement can be supported by alot of Pakistani examples. @ak Does Hassan and Hussain Nawaz qualify as a good example of successful Pakistanis?? What prevents the foreign office in Islamabad from getting these lost & misguided people. Unfortunately Pakistan is also human trafficking hub of Asia. Most of these migrants are not as poor as they claim. The Newspapers should appoint a team to work out a legal way for our young man and women to migrate out of Pakistan LEGALLY . There are many countries suitable for this . I studied in government schools, got good grades in FSc and enrolled into good universities in Pakistan, started with normal jobs, excelled through my career, and ended up in Europe by means of intra-company transfer from one region to another. Nothing fancy. Why can't these people do the same? @Kamran Not a single report on internet reporting Indians among the refugees. On the contrary, Indians are coming back to India lured by good opportunities. @Kamran We can only sympathize with these poor souls since we are unaware of the circumstances that made them desperate enough to try something as dangerous as this. I'm sure the decision was anything but easy for them. The human tragedy and plight of ordinary pakistanis in this story is more important than the bad image it garners for Pakistan. All thanks to the incompetent Pakistani government! I would just like to say two things after reading this article: 1) Being a Pakistani living in Europe, I feel ashame when I see my fellow country men selling flowers or other stuff illegally in the streets. People from other nationality look down on us. 2) We as nation do not want to change at all or we just talk about it and do nothing, lets not forget our leaders are from the same soil as us and we elected them. It is ordinary people like us who sell our vote and harm our nation as soon as we are given the opportunity. Even though I am working here legally and even if I get the nationality, I would not want to live here because I will also be treated like an outsider. Neither I would like to live in Pakistan because I enjoy the freedom and don't get judge by society. @Ali , Sad but true. the border between Iran and Balochistan is manned by F.C....How they are able to crossed it? How come I do not see Indians doing the same even though India is as poor or poorer (as per most Pakistanis) as Pakistan? I dont understand why university students have to take thiss illegal route. They could complete their education and migrate legally. @Ravi No definitely not. You cannot build an image of a country based on some fools. I have been travelling and working in different parts of the world and made so many indian friends and majority of them dont want to go back to India. Thats make india Bad no not at all. @Joe Maybe because they are not very good. Migrants suffer specially from loss of dignity and lacking perspectives for the future. Many Pakistanis leave their homes becuase of these facts. They spend all family savings, leave their homes and - in most cases - don´t improve their lives at all. In the name of holy God, give them some hope at home instead of roaming around like beggers in the world. Greeks have their own economic problems. How can they help numberless people from other countries? why did they leave Pakistan? 3,000 euro's is not a small amount for a poor person to raise in Pakistan. I don't believe the stories of many of these men, some will have legitimate reasons for leaving but most don't and should have stayed in Pakistan. @Kamran You are right but the ratio is negligble, every young man wanted to immigrate at any cost, most of the Indians are going to Aus,Canada,US,UK legally on study visas. One thing is very difficult to understand. Very rich Muslim countries like Saudi Arabia, Uae,Kuwait, Qatar etc. are keeping mum. Why can't they accommodate these migrants? Why do these people have to go western countries only where there will be language,cultural and religious issues? I would be pleased if the Pakistani's or for that matter any non-Syrian economic refugees are deported to their home countries. It is not the matter that these people cause Pakistani's like me living in Europe to be looked down on or to be judged. It is not that because everybody knows they are Pakistani's has led Europeans to believe that indeed our country is so poor and so bad that people have to run away. For me, the only thing is that these people decided to cash in on the opportunity of a lifetime because one country was under war. Syrians were getting killed. Children, elderly, men, women alike! and yet we are so caught up with materialism that we cashed in the opportunity to just go for an economic migration. Population explosion and religious extremism are main reasons of all problems, Pakistanis are facing. Pakistan has not reached that point where its inhabitants need to MIGRATE in fact much much decline in the terrorist attacks has been seen due to the efforts of Pakistan Army in particular and population in general, gradual but improvement is tangible. We have created these types of situations themselves. We had a good leader, Musharraf, who was taking Pakistan to the right direction, but no since he wasn’t a Punjabi we never appreciated his qualities and leadership. Now, look what is happening in Pakistan there is no light at the end of the tunnel. Basic necessities are not provided to common people, as a result they are searching for normal life around the world. Felt, sorry and depressed for our brothers and sisters. This is our doing! Ppl leaving Pakistan are only following the leaders who themselves have their business, children, and assets in western countries. When the so called leaders are based abroad, why should the common man also not try their luck?! So sad state of affairs. The problem is these migrants are giving the genuine refugees from Syria and Iraq a bad name. The latter are fleeing a war, whilst Pakistanis will endlessly criticise the West and then sell everything the have to get there! Ultimate disgrace and shame for our country. @M. Malik " And yet there are some fabulously wealthiest Muslim countries in the Middle East, who have not lifted a finger to take in any of these refugees"
Good point. The western nations and their citizens are doing the humanitarian thing (or being good Christians) and helping those refugees. But can we really expect the mid-east to be so charitable to illegal migrants, they would either by jailed, enslaved or deported. I am sure Jinnah is turning over in his grave, crying tears of blood and wondering what hapeened to his dream of a country where every one would live in peace and harmony. @TechnoKraft Ease of business need not necessarily translates to businesses coming to a country, that is even if we assume Pakistan's ease of business is better than Greece. However, you should know Greece is not exactly a business friendly nation, it was in trouble few years back (2009-2014) regarding external borrowings. But you should know that Greece's economy is far more strong than Pakistan's economy, except maybe for external debt vs GDP factor. yes these idiots spend vast sums that even us in Europe cant afford, to get dodgy visas or arrange smuggling route out of pak, if they invested that money in some trade or business then they could make a better life for themselves in Pakistan. There is money to be made even in Pakistan if you are willing to work for it. Sadly ive noticed that many of the youth there are downright lazy and unwilling to apply any sweat and grit. They only entertain two options, either hope and pray some aunty from abroad will get them married to their daughter or they want to leave the country altogether and pluck the money that grows on trees in the west. @Kamran why don't u post the links to the research reports? Very sorry to see these guys in the terrible situation in Greece. But honestly, its their own mistake... life in Pakistan is million times better then at a camp in Greece... where they are being treated like dogs. There's a picture of a guy from Gujrat who left his electrical engineering studies to go live as an illegal in EU... what a stupid person. Make your life better in Pakistan... don't blame others for your stupid mistakes. @Usman "It's more of a short cut and greed of these people. Unfortunately they bring a bad name to all hardworking and honest Pakistanis in and outside of Pakistan"
Not everyone is greedy. The silver lining is, people do it to make their families move up the ladder. I would not be that hard on all of them. @Kaam No it is not true, some may be returning back to India but lot more leaving India all the time. Remittances from NRI is highest ($69 billions in 2015) in the world even higher than non resident Chinese remittances. Number of illegal immigrants may be less but no official figures available. So we should not single out only Pakistanis for illegal economic migration. @Pakistani "I have been travelling and working in different parts of the world and made so many indian friends and majority of them dont want to go back to India. Thats make india Bad no not at all." Of course India and Pakistan are poor countries and there will be many economic migrants. But India does not have even a small fraction of asylum seekers that Pakistan has despite having a population that is 6.5times as large. Have you met an Indian that would continue to live abroad even if that means having to live in such camps? Have you had someone from India say " I would rather die than be sent back to India"
Another name for immigration (of any form) is "chasing resources". Due to misallocation of resources globally, people are forced to leave one part of the world and move to another. So if anyone genuinely wants to eliminate this issue, create a global set up where there is no imbalance of resources. I am happy to see that that the author traveled across Pakistan. I, on the other hand, live in her country. Every day just in my city here, more good food wasted (and thrown in garbage) than is consumed in several other countries combined. Let's have one day (globally) when no one wastes any food and I can guarantee a statistically significant impact on immigration and new refugee population. Whom to blame first and that is one and only present Govt of Pakistan. @Himmat Sorry no its only corruption and better education except that all is propoganda. @suma -- your point is spot on. While some were honest, other men's explanations made little sense -- like the university student who fled Lahore because a school was attacked in far away Peshawar (the guy copping a feel of the blonde lady's leg in a photo). I've been to Europe and seen Pakistanis who immigrated illegally there. Until recently, once there, it was easy to get residency with a fictional claim of persecution. And life there is pretty sweet even in the worst of the odd jobs, there is so much government support and benefits. These guys' mistake is making the journey a little too late. @Sri Ram -- re-read the article, it did mention Indians were also among the deported. And yes, while some Indians returns by choice to do IT, many more want to leave. There are more Pakistanis only because the Indo-Pak border is pretty closed (hard for illegal Indian migrants to cross). India, like Pakistan, is a tough place for the poor and lower class. @Alla Bux -- because India's border with Pakistan is pretty closed and hard to illegally cross. Otherwise, if it were more porous, yes, you would see more poor Indians in Europe. The story about kidnapping sounds so fake. Like wasn't the police notified of someone holding someone hostage in their basement. Secondly, his family could afford 3000 euros which is like Rs. 300,000.00 You do the rest of the math. dude, what is more shameful for pakitanis than these illegals is someone like you who wants to compare with your supposed 'arch-rival'. Thank god we have no rivalry anywhere... at least not when it comes to illegally entering another country. Its very tragic. Someone in the Govt. of Pakistan must take responsibility of arresting all the unscrupulous facilitators who are obviously making large sums of money off of these naïve and gullible individuals. The govt. might want to advertise in the media about how hard it is for illegal immigrants, more like impossible, to enter Western Countries and warn the citizens of the false promise makers. Once few arrests are made and the culprits are put in front of the camera, will go long ways in alleviating this problem of broken lives. What a shame. We have to leave our nation and beg admittance to Europe. Thank you for the compassionate article, we must remember in the end, these are just people trying to find a better life for their kids. Shameful. The government should arrange for immediate repatriation of all these Pakistanis. @A. A. Who wants to put in that effort. They want overnight riches. It is not shameful for Pakistan! since the establishment of India and Pakistan, millions of people want to live in europe and america by hook and crook. If you get a chance you will do the same. These illegal migrants should be brought back to Pakistan and prosecuted by the government. It is not the governments who are destroying the country it is the sheepish people.
. Is that bad in Pakistan that their young people are leaving the country.???? Pakistan should ask these European govt. to return back these people detained . Shame on your govt. Pakistani people have the habit of suffering silently, they don't know how to oppose injustice, they simply become the victim of circumstances. And the same case with we Indians. i think the job market is much better in Pakistan than in Greece they are actually misguided ignorant,most of them are from villages, how used to see their neighbors having a big home and car whom is already settled in gulf and EU, this the the cake on which agent tricked them off for a over night rich .many of them even dont know where is Germany . @Rahul Desperation, poverty, helplessness, corruption, lack of education, lack of contacts and influence...I could go on and on. there are a lot of opportunities here in Pakistan, but these people are the most greedy persons . i am totally unable to understand the reason why a student of electrical engineering quitted his studies and went to that hell while he was able to start a splendid career in Paksitan. @Rahul Go visit any European country and you will find ten times more Indians than Pakistanis there illegally! Is India really that bad? Its easy to point fingers at others. India is no developed country my friend. Half the country is still as it was 50 years ago! people are running way from Pakistan because of poverty and the country so called leaders running away stay in London and Europe and USA because of corruption charges and looting these poor people, leaders where families living in luxuries abroad with billions dollars and their country poor can not afford to have a decent life. shame on this country leaders. @Indians are hard working and have self respect. @Skeptic Thats not the point. By examples I mean Malik Riaz, Makkays, kaymu, Pakwheels, olx, and just for once go through blue are once and you will find out for yourself how young entrepreneurs are fighting all odds and making a fortune out of it. Actually us Pakistanis have developed a habbit of complaining rather than getting up on our feet and fight for what can be ours. I respect your disrespect for the Nawaz but considering the context in which I posted my comment your suggestion (if thats what it is) is highly irrelevant. Pakistan will soon be empty of working people. @Kamran really? We have 1.3 billion people but the people here have hope and are spending money on education. Very disappointing to see these folks leaving their motherland. But the question is what our government has done so far to address the issue? At least they are a free people in Pakistan. Why would they move to a distant dream? Why not help yourself, and start some business with the money that illegal touts and criminals are looting from them? @Kamran: "Work hard , and you'll succeed" is a faded old adage. Many hard working paople are routined ly robbed by employers, neighbours, family and militants. For the migrant university students, the shoot up was enough to chase the peace-loving people out! Pakistan was created in 1947 for a Pak citadel for its people to escape from Indian Hindu oppression! Sigh! What happened?Now you got your own brothers and sisters oppressing you! @AsR: That is if they are tradespeople! @Zubair Abro :Wrong at all levels,Zubair! Why are the rich Arab nations not taking in the poor Syrian, Afghan, and Pakistanis? WHY???? @Iftikhar Husain ;Yes! YOU tell them Iftikhar! Pakistanis undertook this most dangerous journey. The lack of economic development is the reason which is triggered by terrorism and extremism. we can't remain disconnected with the world. To encourage foreign investment we need secularism. All those have left pakistan because even.they are qualified enough to basic amenities but rulers of pakistan did not provide them these basic amenities despite promise which they made openly at time of general election Pathetic.indeed! Most of these 'asylum seekers' have no skills, no education, fake asylum claim, being misled by agents who run lucrative human export business. Just by turning up on someone door does not mean they should be entertained. Genuine migrants go through legal means. 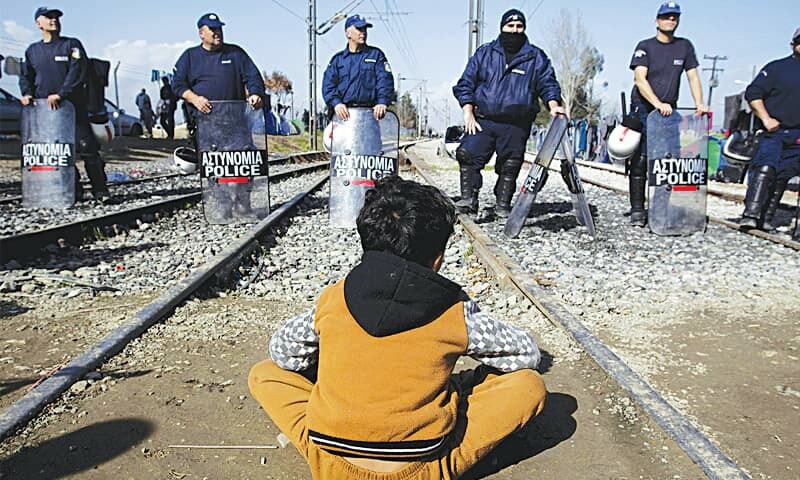 This world belongs to humans and there is no doubt that these men are as human as any of the Greeks. They have already suffered a lot. Let them redefine their lives, I appeal! Some of these so called Refugees from Pakistan have sold their Farming Land in Punjab in excess of $100,000 to pay for their families to settle in europe . There is a Town in Norway that has 10,000 people from Gujrat,Punjab alone. and the population of Locals is less than 8000. go figure! Its happened, when Governments dont have vision for the nation. @Jamal it is you & us who failed him. He had won his battles. @JP Don't get a big head if you see no Indians here. It is just this lot but Indians are leaving India in ever greater numbers both educated and illiterates. Nope -- you are wrong, Kamran - -majority of the asylum seeker and illegal immigrants from Syria, Iraq, Afghanistan and Pakistan -- NOT INDIA. 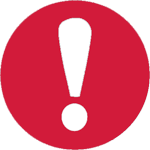 Do not spread wrong news -- admit the sorry state of your country pakistan. @Abdul Wahab .. I totally agree with you. when I was in Pakistan I had the same frustration surrounded by same corrupt politicians none has died even their off springs are ready for slaughter of Pakistani economy. Having said that in midst of all the chaos Pakistan offer to you I work hard never asking money from my parents … doing private tuition, jobs and paid my own fees, expenses … now I have been away from Pakistan for over 10 years based on the education and living a respectful, peaceful life with full Faith and practice of my religion. Bottom line it takes time and effort but get yourself EDUCATED the biggest weapon against any challenge and poverty. This is the state of Pakistanis. Don't expect the world to respect a nation who are in this condition. They would rather die than go back to their own country?? @A Shah -- Yup reality is harsher than it what you are told (A deeply sanitized version or not covered at all since it does not match the national narrative). 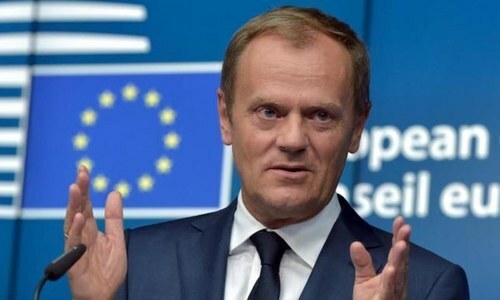 @Kamran You realize that even before Migration crisis began there were 168,000 illegal Pakistanis (not all of them identified yet) as of November 2015 that EU wants to deport? Economic migrants taking advantage of Syrian crisis! Europe is well within its rights to deport them! Shame on that anarchist group for not helping the "right" refugees! I don't want t sound callous, but if they can stage a hunger strike in Greece, they can stage one in Lahore or Karachi instead. Why are they going out of the country like that? Speaks of the existing conditions in Pakistan. What is happening? It's very sad to be stranded like that. heart touching but great work Jodi. really inspiring words and photographs are just self explanatory. This is only a tickle if things do not improve in pakistan there will soon be a deluge of migrants leaving pakistan in near future. Pakistan needs to improve security and economy. And no half measures will yield results. Result of a lawless corrupt society in Pakistan.When the leaders will respect hard work and merit.When people will learn discipline and organization.When people will give up fanaticism.The Pakistanis will progress and prosper. @sunil Reread the above, there are indians too. Shameful young Pakistani men.Deport theses useless men back to Pakistan.They aren't refugees in any sense. @Ali Anecdotal statements do not mean anything. Show one authoritative source on illegal Indians in Europe. You won't find any.